The Question:I don’t mind Windows 8 too much after using it for a while, but I really can’t get over the loss of the Start Menu. I know 8.1 puts a button on the lower left of the screen, but I want my menu. How can I fix it? 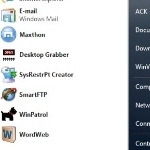 Ask Dave Taylor windows 8 start menu. permalink. Dave, considering your a computer expert your website is the most dodgy site, I have ever been on, adverts and malware city baby.